Nicknamed the "dragon stone," septaria has unique mineral patterns that resemble tree branches. Specimens are usually in the form of sliced nodules ranging from an inch in diameter to more than three feet across. They are estimated to have formed between 50 and 70 million years ago after periodic volcanic eruptions killed small sea life. The shells and carcasses of these creatures sank to the sea bed, where sediments accumulated around them to form nodules or balls of mud. When the waters eventually receded, the mud balls dried out and began to shrink and crack into the beautiful patterns that you see inside the septarian nodules. 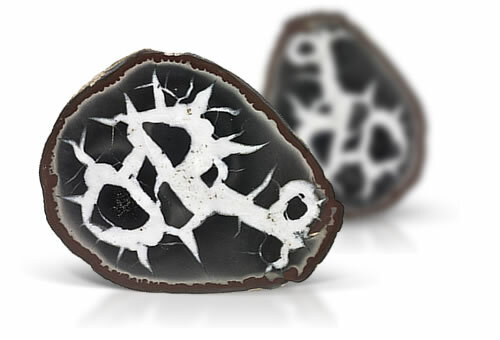 Septarian nodules often contain calcite crystals and rarely pyrite. Septaria are cracks or separations in rock.